Rhondale was an outstanding sprinter/hurdler at Delcastle. She was a four-time Indoor Athlete of the Year (‘95, ‘96, ‘97, ‘98) and a two-time Outdoor Athlete of the Year (‘97, ‘98). She set the still standing state record in the 200m dash at :24.17. 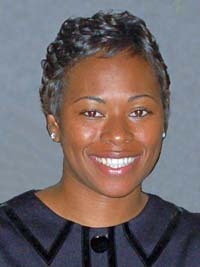 She went on to Lincoln University where she was a sixteen-time All-American including nine individual titles from 1999-2001. She won three titles each in the 100m hurdles, the 100m dash, and the 200m dash. She currently holds the NCAA championship record for the 200m dash with a time of :23.72 set in 1999. She was named the NCAA Division III Most Outstanding Student-Athlete in track & field, an honor which was bestowed as part of the NCAA’s 25th Anniversary of Women’s Championships celebration and takes into account outstanding performances in NCAA championships over the past 25 years.